Overall, I wasn’t a big fan of SomaBiotix Probiotic Digestive Formula. I gave it 2 out of 5 stars because there aren’t a ton of things I like about it and I have some issues with it. A few things I like are that you only have to take 1 capsule per day and you don’t have to refrigerate the bottle. It also has some additional blends such as digestive enzymes, B vitamins, and natural herbs like ginger root and parsley. Digestive enzymes may help you absorb more nutrients from your food and the herbs used may also aid in digestion. Those were pretty much the only positives I found with this probiotic. So here are my issues with this particular product. First of all, it’s very sales-y. I immediately frown on websites that harass you with upsells and bundles. Every click on the SomaBiotix website seems to result in more sales tactics. The prices are even confusing because everything is marked down and showing you a percentage off and just the price of one bottle, not all 2-5 bottles. So, the website was frustrating to say the least. The product is also very expensive. One bottle costs you almost $40 with shipping and only lasts one month. It also doesn’t have any sort of satisfaction guarantee, which is a total bummer. This may seem nit-picky but the print on the actual bottle is close to impossible to read. The font is tiny and not clear, making it a hassle to try and read the ingredients and strains. It’s also not very diverse as far as the strains go because it only has 2. It contains gelatin, which is an allergen for some people, and doesn’t specifically list any other potential allergens. Overall, I was disappointed with this probiotic and gave it 2 out of 5 stars. 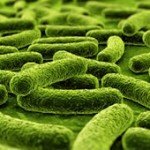 SomaBiotix Probiotic Digestive Formula has 2.5 billion cells in 2 probiotic strains. 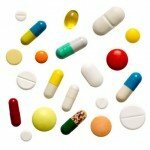 One strain used is Lactobacillus acidophilus La-14 (SD5212). I do like this particular strain because it’s been researched in countless studies and is one of the most popular strains used. The second strain in this probiotic supplement is Bifido Bacterium (Bb-06). This particular strain may help prevent the growth of bad bacteria, promote healthy digestion, boost immune system, and reduce inflammation. This probiotic also uses a digestive enzyme blend of amylase, cellulase, lipase, and protease. It has vitamins B1, B2, B6, and B12 and ginger root, parsley leaf, and peppermint. SomaBiotix Probiotic Digestive Formula contains gelatin. This isn’t a huge allergy concern, but some people do have problems with it. Also, the supplement doesn’t specifically list any other allergens. This makes me a little wary sometimes when there isn’t any information listed. 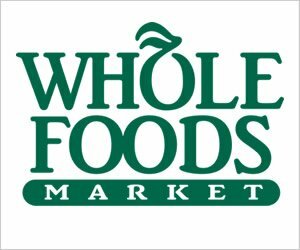 Normally companies will have it listed very obviously if a product is free of certain allergens. So maybe if you’re really allergic to anything, be careful with this one. The other ingredients include: magnesium stearate, ginger root, parsley leaf, and peppermint. For 30 capsules, lasting 30 days, it costs a total of $38.98 ($34.99 + $3.99 shipping). That works out to $1.29 to take this probiotic every day. Anything over a dollar per day is pricey, so this is way up there. I don’t think it’s a good value for the price, there are much better options out there. I didn’t have any side effects while taking this probiotic. At 2.5 billion cells, it’s not very potent. 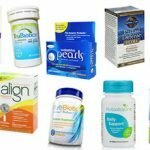 Sometimes you can see bloating, gas, or stomach pain while taking probiotics. I couldn’t find any type of guarantee on the SomaBiotix website. This is a huge disappointment, especially since this product is really expensive. Even to try and return the product you have to call Customer Service at 1-888-495-7076 before any possible arrangements can be made. To top it off, shipping and handling fees are non-refundable. The whole process seems long and tedious. 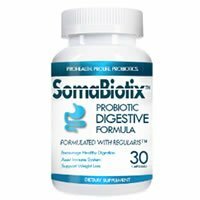 To buy SomaBiotix Probiotic Digestive Formula, click here.